Click on the Word 2007 orbit button on the top left corner and click on word option. On the left hand side click on the Advanced tab. 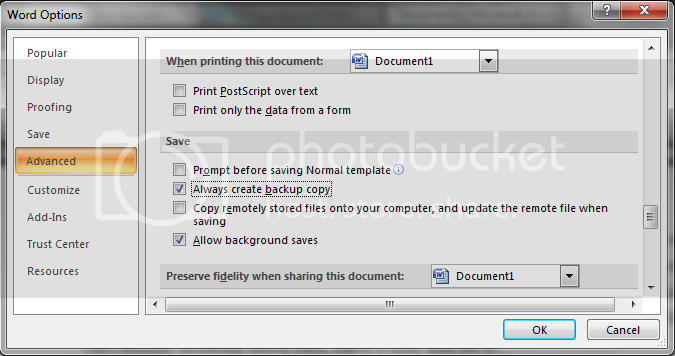 Now, on the right hand side, check the options ‘Always Create Back-up copy’ and then ‘Allow background Saves’. Click ok. This will help you re-store all your files instantly. The back-up files of word are saved as .wbk. Restoring files from these files is easy, so you don’t need to worry much. C:\Documents and Settings\username\Local Data\ Microsoft\Word. C:\Documents and Settings\username\Local Settings\ Temp. In the above addresses change ‘username’ to the windows username. Here you can find many of your unsaved temporary files. If you system crashes open your Microsoft Word once again, it will restore the data immediately.